This week, I had the pleasure of being selected for Jury Duty in SoMa. Luckily, there are tons of great lunch spots in this area. Being only 2 blocks away from SO, I already had the delicious Wings once this week (previous post here), however, I decided to try something new. Walking over to some friends in the Civic Center area, I pass by quite a few interesting eateries and cafes that I wish I could stop by and try out. 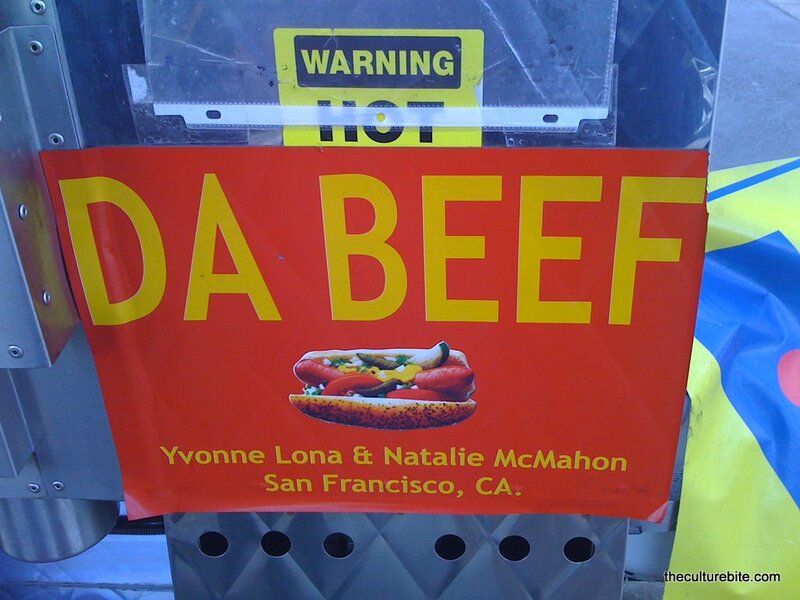 One place was a little hot dog stand called Da Beef. It’s located on the corner of 7th Street and Folsom at a Oil Change place called Oil Can Henry’s. What drew me to this place was that they didn’t only have hot dogs with the normal toppings, they had Chicago-style hot dogs, Italian Beef, and a little something called Frito Pie (more on that later). I had the Chicago-style Hot Dog and my 2 friends had the Italian Beef and the Beef-N-Cheese. Chicago-style Hot Dog – For those of you not in the know (like me), Chicago-style hot dogs are hot dogs in a poppyseed bun with mustard, onions, pickles, relish, peppers, onions, and celery salt. I personally found that there were way too many toppings on it, although it definitely tasted great. I probably should have grabbed something else like a Chili-Cheese dog or their famous Italian Beef. Italian Beef – I watched the magic hands in the cart craft the Italian Beef. First, the roll is soaked in Da Jus, then after the roll is taken out of the Da Jus, more Da Jus get’s ladled on top. The next layers was multiple slices Italian Beef then topped with peppers. Oh, it looked sinfully good. Beef-N-Cheese – The Beef-N-Cheese was the winner of the bunch. It’s basically the same as the Italian Beef, except ooey-gooey nacho cheese is slathered right on top of the Italian beef slices. Frito Pie – I don’t mean to be such a tease, but let me explain the Frito Pie. Luckily, there was still one bag of Fritos at the stand. The bag is cut open to reveal the basic ingredient within a sturdy vessel for some toppings. Chili is poured right on top of the Frito chips, then smothered in the ooey-gooey nacho cheese sauce and topped with onions and peppers. This is an awesome concept. You can always buy Chili-Cheese Fritos at 7-11, but when can you have Fritos with real Chili and Cheese right on top? Thank you Da Beef. This was an awesome experience. All-in-all, the Chicago Dog and Frito Pie cost be $6. I was full and satisfied and a bit worried about my health. It was still really fun to try this out.